There are so many amazing things to do in St. Thomas USVI during a day trip from St. John. From the Latin and Pacific Rim culinary infusion to turquoise waters for snorkeling and kayaking, the Virgin Islands offer the perfect vacation oasis. And when you stay in one of our luxurious CimmaronStJohn vacation rentals, you will have a private place in paradise during your stay! Enjoy incredible mountain top and bayside views on the smaller island of St. John, a little secluded from the main hubbub at St. Thomas. However, if you’re staying for a week or more, we do recommend a day trip over to our neighboring island for some unique activities you are sure to love. Here are some of the best things to do in St. Thomas USVI during a day trip from your CimmaronStJohn vacation home! 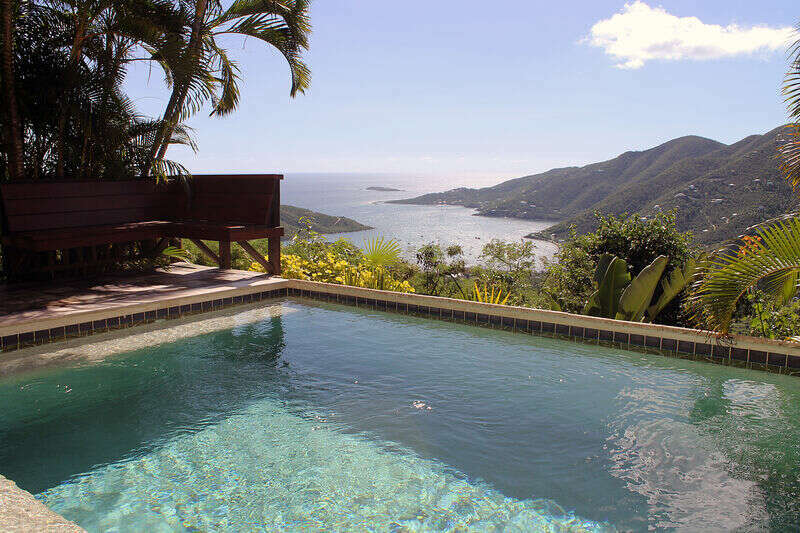 Browse our gorgeous vacation homes on St. John to discover which location is right for you during your extended island getaway! Then read our blog for all the activities you can enjoy on St. John USVI in addition to things to do in St. Thomas USVI. You may have heard of swimming with dolphins in the Caribbean, but have you heard of swimming with sharks? It’s not as dangerous as it sounds! In fact, it’s one of the best things to do in St. Thomas USVI. It’s also one of the main attractions at Coral World Ocean Park. Discover five acres of exotic aquariums, an outdoor marine pool, and expansive nature trails. During your visit, you can feed stingrays and wild iguanas, along with enjoying other island wildlife. And yes, you might even get to pet a shark! For the golfers traveling to the Virgin Islands, your paradise course awaits on St. Thomas. Enjoy playing on the 18-hole, par-70 Mahogany Run with stunning views and challenging greens. This gorgeous cliffside course is famous for its Devil’s Triangle (a difficult three-hole stretch), making it a destination for experts and amateurs alike looking to get the better of it. This course is also located just 15 minutes from the Red Hook ferry terminal, which will take you to and from St. John. When you are thinking of things to do in St. Thomas USVI during your day trip from St. John, the Sky Ride at Paradise Point should make your itinerary. This enclosed ski-lift ride will take you 700 feet above town, giving you amazing views of boats in the harbor and the many sites below. Sit back and relax as you make your ascent! Discover St. John and All it Has to Offer As Well! While there are many fun things to do in St. Thomas USVI, there are also plenty of thrilling watersports, historic attractions, and beach activities to enjoy here on St. John USVI. And with our CimmaronStJohn vacation homes, you will get a secluded privacy among the lush vegetation, rolling hills, and surrounding blue waters. That’s why we recommend making it your island home during your vacation stay! Discover the hidden gem of St. John and all the magic it has to offer. See you soon in paradise!